The project work assigned to us was to design a 132/33 KV EHV substation. We considered incoming power at 132 KV and the power was transferred to main bus through isolator-circuit breaker-isolator combination. 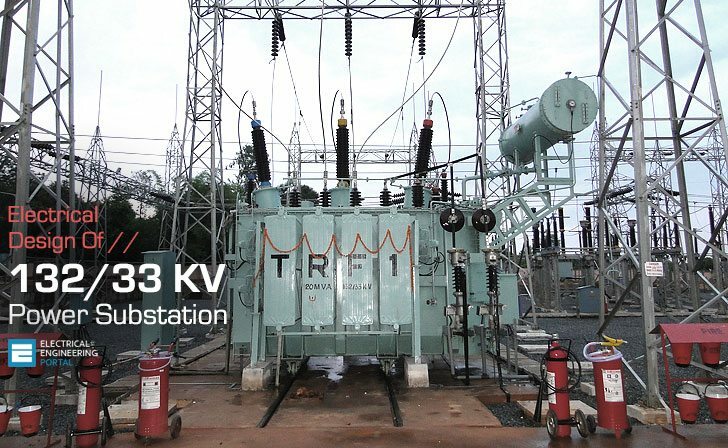 The power from main bus was fed into a 20MVA transformer which stepped the voltage down to 33KV. The power is then fed into a 33KV bus from which different loads were tapped. In the process, the surge impedance loading of 132 KV and 33 KV lines were calculated and they were used to estimate the maximum power that can be transferred by one transmission line. The design of the entire substation was made keeping in mind the most basic requirements of a proper substation including the civil and domestic requirements. Starting from the generating stations to the end users, voltage is needed to be stepped up and down several times in various substations. This ensures efficient transmission of power, minimizing the power losses. Our project is to design a 132KV/33KV EHV substation where the incoming power is received at 132 KV from a generating station. The power factor is corrected here and the voltage is stepped down to 33KV and power is then transferred to distribution system of the grid to meet the requirements of the end consumers at their suitable voltage.